Hi mamas! I just discovered the joy of shopping for diapers online!!! 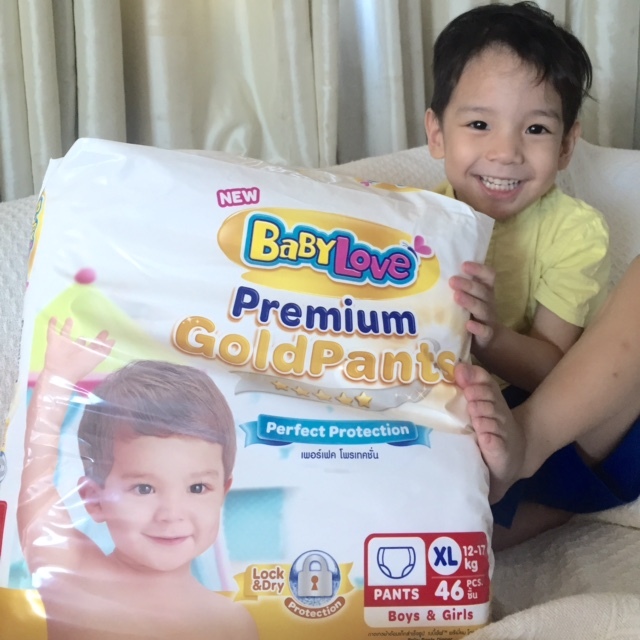 And I found a new diaper brand and we love it, too—BabyLove Premium Gold Pants. But first, the back story: Ever since I've blogged about products I love, it's become stressful to do the grocery. Why??? Let me tell you this one time I wanted canned corn kernels and my usual brand had run out so I grabbed another brand instead. No biggie, right? Wouldn't you know that a blog reader just happened to pass by and remark, "Ay, diba Jolly ka?" GUYS. Stress! It's not just when there's no stock. There have been many times I wanted to try out a new product I saw on the supermarket shelf or on another mommy blogger's IG feed and I couldn't! So I was telling the girls at work that the supermarket near the office didn't have my toddler's diaper size and I had to go to a much farther grocery store to get our usual diaper brand because I can't buy another brand in case there just happens to be some blog reader passing by to question my brand loyalty. They laughed at my ridiculousness, decided they'll never become a blogger, and said, "That's so crazy. Why don't you buy diapers from Lazada or Shopee then? They're much cheaper, there are more brands available, and they're delivered straight to your house!" Straight to my house...! Why did I never think of that?! I never realized you can buy diapers online! 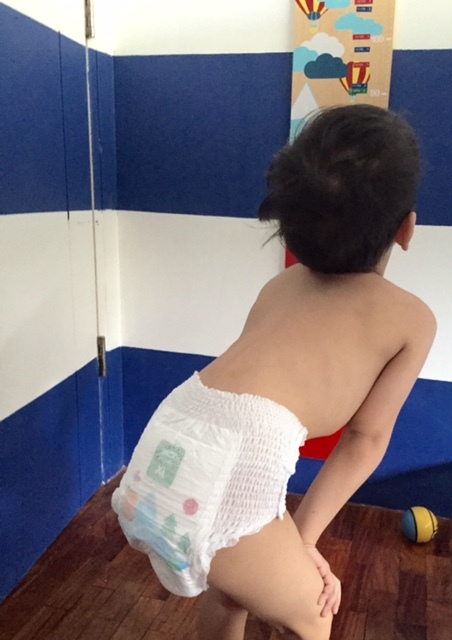 So I went to Lazada and Shopee and sure enough there were diapers upon diapers upon diapers! Good thing there were official stores so it was easy to find authentic products. I was about to put our usual brand in my cart when I remembered that I am now safe to check out other brands. Oh yes! So I clicked on this diaper and that diaper and then discovered BabyLove. 1. As I was clicking away, Piero, my toddler looked over my shoulder and liked the baby on the packaging. "That one, Mama!" So I clicked on it and read the description and figured it was worth a try. 2. I did some research because of course we mommies always research on the products we use on our kids. I found out that BabyLove is a Thai brand. Now, Thailand is the last country I visited so I felt a connection. So I guess that's also why I had more interest in this diaper than the others online! 3. Mommy blogger friend, Denise of Royal Domesticity, uses it on her new baby girl. In fact, she was the one who told me about BabyLove so since I like checking out what my friends use, I said yes to this brand! Denise blogged about BabyLove here: #MyBabyMyWay should be the official hashtag of your motherhood. 4. Okay, I wanted to try a high-end diaper. Yes. Because Piero has extra sensitive skin (compared to his older brothers, he has allergic reactions to more things). My research told me that BabyLove has all the qualities I look for in a diaper: absorbs fast and well, no leaking, keeps skin dry, and made of really soft material. I was so happy that when the diapers arrived, they looked and felt and even smelled so posh! 5. I also discovered on Instagram that BabyLove is supporting mothers' choices in raising their babies through their #MyBabyMyWay campaign. We may have different ways but our choices are always dictated by love. I like that. I support that. There's just too many mommy wars out there when we should just all be supporting each other. Motherhood is hard enough already. Let's just believe that the mother who raises her kids differently than we do made the best choices given their situation. So I got the BabyLove Premium Gold Pants because we're trying to toilet-train Piero. The pants arrived fast and we just started using them last week and so far so good, we love the "dia-pants"—that's what Piero calls them haha. 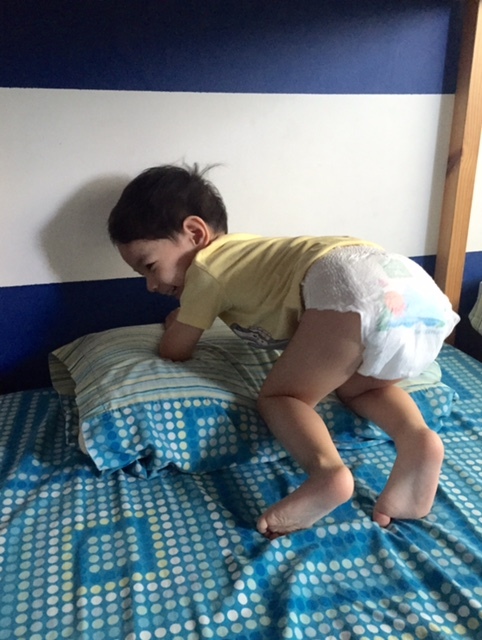 We actually still have a dozen pieces of our old diaper brand but Piero doesn't want to use them anymore! 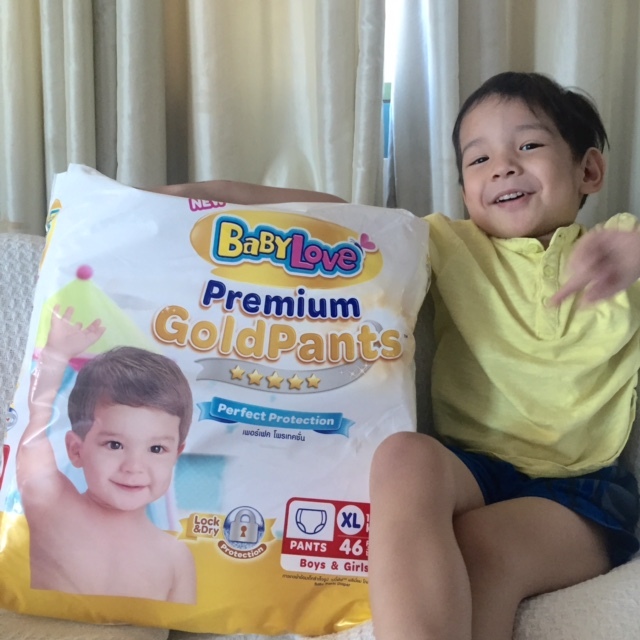 That's how much he loves his new BabyLove Premium Gold Pants! I'll do a proper review next time since this post is getting long haha. Anyway, just sharing some good news: If you want to try BabyLove, get good deals (up to 30%-50% off, mamas!) on this great find on Shopee's Baby Fair Event on April 19-24. Shop here! Piero is so gwapo. 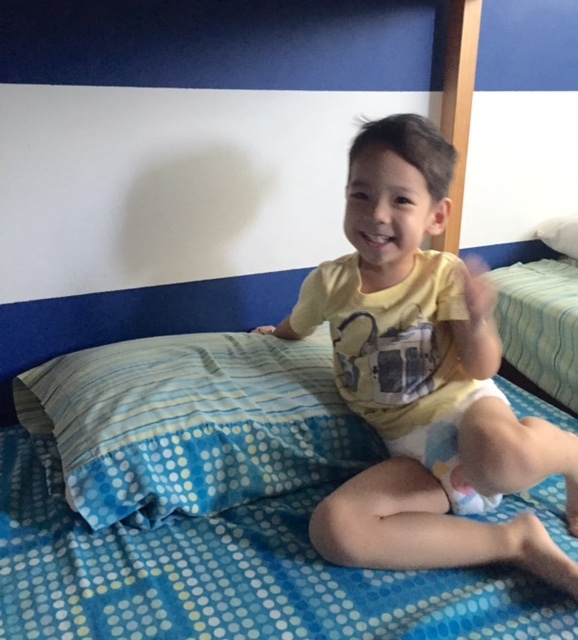 Kita sa smile sya na gusto nya talaga ang new diaper nya.